Vasja Nagy, the founder of Art in a Suitcase, invited the Italian curator Paolo Ferluga from Laboratorio_p , to present the members of the gallery in Trieste. 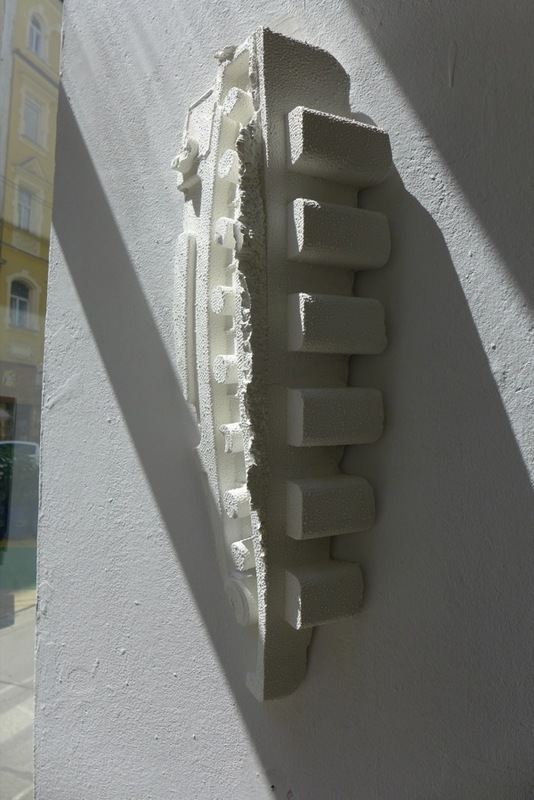 The Group Exhibition is a creation of Paolo Ferluga, Italian artist living in Trieste. He graduated from Architecture but very soon dedicated his life and work mainly to painting and art. After starting with abstract painting he developed a variety of styles. Later he understood that each of the style in which he paints, puts him in a particular state of mind, and enables him to view the world from a particular point. In the last year he created 5 aliases that state for each of his styles in which Ferluga creates and stand for different personalities. An architect and landscape planner, Pavel von Ferluh believes that a landscape is the apparent outcome of prevailing ideologies. From the original picture (landscapes taken from photos or memories of a real place) he images future developments, where the drive of change depends once again on gambling on one ideology prevailing over others deployed by our societies in their evolution over time. An extremely autonomous artist with great personality, she allows herself to go past any technical and formal conditioning that limits the full and natural expression of her creative freedom; she masters the use of colours and of the sign, thanks to a perfect knowledge of the compositional and formal parameters of the artistic creation. A restless artist, he is always searching for something new, Paul Scontemporary is in fact fully the epigone of a fading age. His wall art pieces speak to us about a world that we already know and do not want to let go of. He effortlessly and nonchalantly combines the most disparate objects and materials. His gaze is pure and indiscriminate like that of a 20th century guru. A sensitive romantic, Pablo Soltero creates minimal landscapes in which he places minuscule newspaper cutout figures against backdrops of vast color fields that retain only an “homeopathic” trace of the real landscape. These tiny figures, through their mere presence, generate motion and appear to be posing to the observer a number of multiple-choice questions, the answers to which will never be exhaustive. Inexhaustible and hyperactive, Pao Lin creates intricate and articulate universes of forms and colors, consisting of a mix of collage and acrylic paint, based on the principle that every stroke and mark left on the canvas must be generated automatically through an intuitive process. The final result stems from the dynamic balance between the countless marks that make up the whole. A journalist with a passion for visual arts, he uses “yesterday newspaper” to “save a piece of news from time oblivion”. So he cuts out pictures from newspapers, shapes them and paste them on a golden background, thus transforming a perishable visual matter in a timeless icon. Art in a Suitcase is a curatorial project created by art critic and curator Vasja Nagy in 2010. The project is based on the need of communication between contemporary artists, art spaces and galleries, theorists, and public. The result is established connections and collaborations. The form of the project is packing artworks of international artists in a suitcase and travel in a short period of time to as many places as possible and (re)present the artworks, the artists and the idea of the project itself, which acts as a critic of institutional art production and presentation. The travel in 2010 included cities of Vienna (12-14 contemporary), Budapest, Prague, Dresden, Berlin, Ravenna, Mola di Bari, Istanbul and a year later Ljubljana. The travel in 2016 (in collaboration with 12-14 contemporary) was in Mexico and included events in Oaxaca del Juarez, Xochimilco and at 3 spaces in Ciudad de Mexico. The final exhibition will take place at Museo Cara in Muggia near Trieste in spring 2018.